Ready to explore your town and its surroundings? And even go on a trip with your family and/or friends? Then check out the new 2018 Ford Explorer! It has been designed to be reliable wherever it is taken on an adventure.This smart looking SUV is definitely the right choice for you! The 2018 Ford Explorer has five different trim levels for you to chose from. They are the Explorer (Base), XLT, Limited, Sport, and Platinum models. You will certainly be able to find the perfect SUV to satisfy your needs and those of your family. Explore this new ride further to discover its awesome features. The 2018 Ford Explorer is a very powerful SUV. The different trim levels have similar engines and therefore similar capacities. The trim levels all come with a 3.5L Twin independent Variable Camshaft Timing (Ti-VCT) V6 as a standard engine. This engine is capable of producing 290 of horsepower and 255 of torque. The front-wheel drive model has a fuel consumption of 13.9L/100 km in the city and 9.7L/100 km on the highway. There also optional engines for drivers who are looking for a more eco-friendly engine, such as the 2.3L Turbocharged, Direct Injection Ti-VCT EcoBoost® I-4 and the 3.5L Twin Turbocharged and the Direct Injection EcoBoost® V6 engines. The latter can push up to 365 horsepower and 350 torque. Furthermore, the combined fuel consumption for this engine is 13L/100 km. 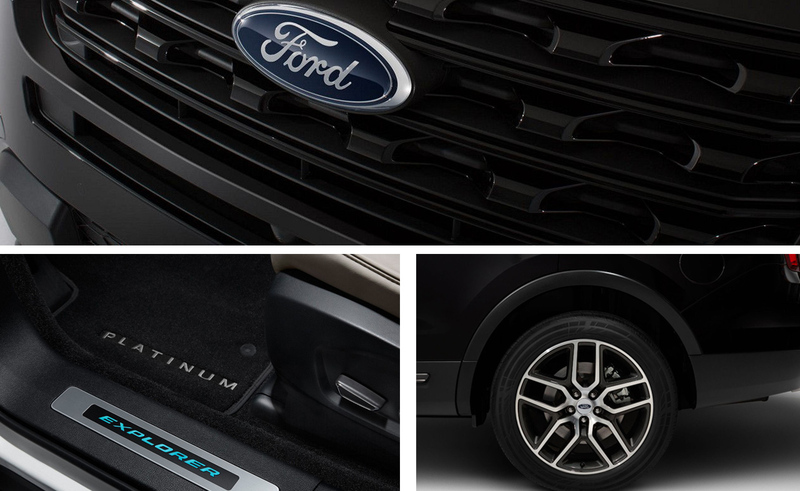 The Sport and Platinum models only have an AWD drive, while the XLT and Limited models have an AWD or an FWD. This SUV also has an impressive towing capacity. The Base, XLT, and Limited have a towing capacity of 907 kg, while the Platinum and Sport models have a remarkable towing capacity of 2,268 kg. Let’s talk now about your safety. Safety is an important aspect for Ford when designing and manufacturing their vehicles. A standard safety feature in this SUV includes the Belt-Minder® system that serves as a reminder with a sound and by lighting the seatbelt sign to warn the driver when a seatbelt is unbuckled. The Safety Canopy® System is a side-curtain airbag in the case of a rollover accident. They help prevent the passenger’s head from hitting the window. Still with the theme of airbags, there is a Front Passenger Knee Airbag to ensure that the passenger’s knee is not injured during a collision. In the event of a crash, there is also an SOS Post-Crash Alert System to help you and your passengers request assistance quickly after a collision. There is also optional industry-first inflatable rear outboard safety belts. This design shares the crash force energy across the passenger’s torso. The styling of the 2018 Ford Explorer has been slightly modified. It has different sets of lights including automatic LED low-beam headlights, daytime running lights, fog lights to enable you to see clearly and to also be visible to other drivers. This vehicle is also built with an easy fuel capless fuel filler which makes you avoid fuel theft and splash back. Optionally, there is a solar-shaded windshield and front door glass. Inside this wonderfully designed vehicle, a rear auxiliary climate control enables the passengers at the back to set their own temperature. On those cold winter days, you will not need to go outside in order to warm up your car because you can use the remote start feature right from your home. From the comfort of your vehicle, enjoy cleaning your rearview camera just with a push of a button. With the 2018 Ford Explorer, you can also get all-weather floor mats and a blind spot information system (optional). There are many additional parts and accessories to enhance the exterior and interior of your vehicle. Check out our Zender Ford dealership in Spruce Grove for more information. Get in touch with us if you have any more questions. We are here to help!